Attention right-wing fringe: Are you still rocking an empty chair in your lawn to convey your (possibly racist) sense of dismay that Barack Obama is our president? You’re behind the times. 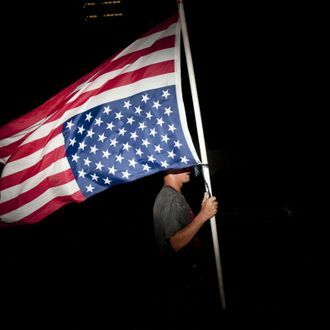 The new hotness, according to the style mavens at the New York Times, is to stick an upside-down flag in your yard. That way you convey the sense that it’s not just Obama who’s the problem, but the majority of Americans who voted for him. If you want to throw an extra twist in there you can do like Jim Harris, of Genoa, Illinois, and add a sign that says, “enslaved by the 47 percent.” That wouldn’t be the 47 percent who voted for Mitt Romney, would it?